is one of the central figures in the formation of conceptual art in the 1960s. 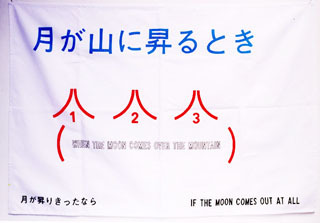 Our collaboration with Lawrence Weiner. 1992, we've published the multiple "AS LONG AS IT LASTS" which is stainless steel stencil cut out of it with the words of "As Long As It Lasts". With this stencil, you can draw in any place with any color as you want, as the artist's installation. The multiple of "Do-It-Yourself" . Weiner's first visited to Japan was mid-summer August in 1995. We had solo exhibition, the 2nd multiple was produced with Japanese traditional theater "Noh-Kyogen" as the theme. "Kyogen" is characterized by satirical comedy story with sophisticated dialogue and simple and minimum stage set. 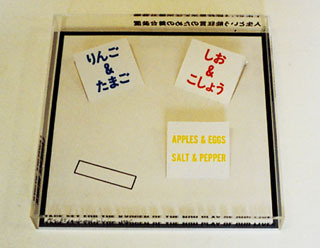 Weiner considered the stage of Kyogen as life, and he made pop and humorous stage set for Kyogen on relation to four necessities (apple, egg, salt and pepper) and others, function of the things, our roles in our lives. Black rectangle represents holy place because holy element is also necessary for people as well as daily necessities. 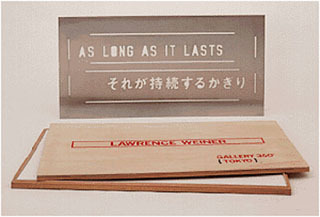 The text in this work was from Weiner's impression in his first stay in Japan in 1995. It reminds us the story of Genji Monogatari, or Taketori Monogatari and also a quiet moment before something going on. This multiple is dyed on cotton cloth. Weiner's studio in Amsterdam is a boat house. 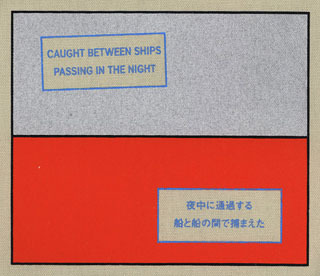 The text is from the scene he saw several times from his boat. Tension and dynamic movement in the text arouse our imagination. This small cloth is as chit by the artist, you can enjoy this multiple putting inside your coat or shirts. This publication project is commemoration of activity of ten years with the artist. One day in 2002, photographer Shingo Wakagi accompanied artist Weiner as he completes his daily task. A Day in the Life is a visual documentation of this project; it offers a rare (relatively) wordless glimpse into the home and studio of the conceptual art master as hi smokes, cooks, thinks, gardens and makes art. There are inserted images of ten years documentation between the artist and the gallery since 1992 in the book. Time of ten years is together in a day - this unique idea is by the artist.